FVCA is a statewide collaborative of parent-run centers working to ensure quality health care for children and youth with special health care needs. 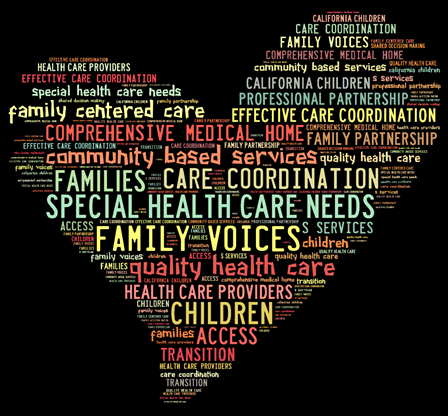 FVCA was established through the linkage of Family Voices National* and the Family Resource Centers Network of California*. FVCA is a family-to-family health information center and operates under the auspices of the grant #H84MC07943 (U.S. Department of Health and Human Services, Health Resources and Services Administration, Maternal and Child Health Bureau, Division of Services for Children with Special Health Needs). *Family Voices National is a national network of families and friends speaking on behalf of children with special health care needs. *Family Resource Centers and Networks of CA were formally established in 1997 when the CA Legislature authorized a statewide system of 52 parent run Family Resource Centers in recognition that family-oriented and parent-to-parent support services are a key aspect in early intervention for children with disabilities.